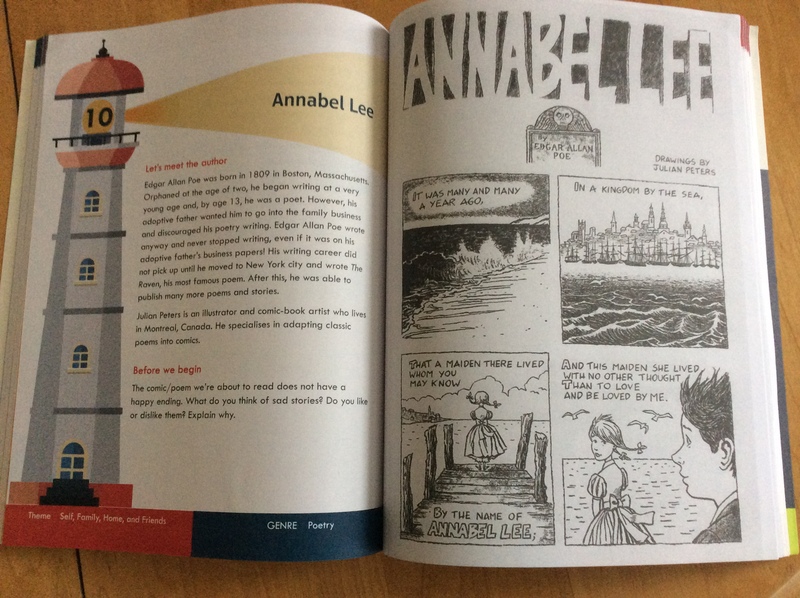 My “Annabel Lee” comic a teaching tool in India! 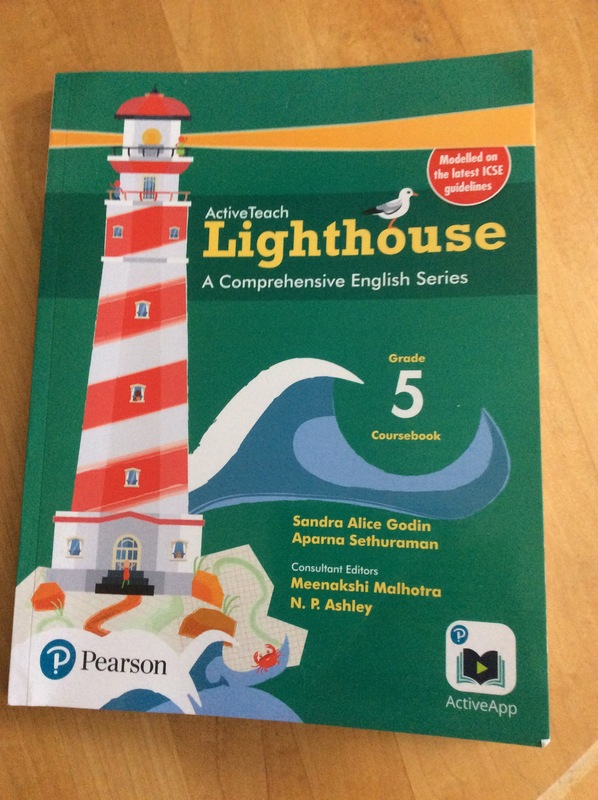 I recently received my complimentary copy of the “Active Teach Lighthouse Grade 5 Coursebook” a school textbook for English second language learners in India, published by Pearson India Education Services in Chennai. 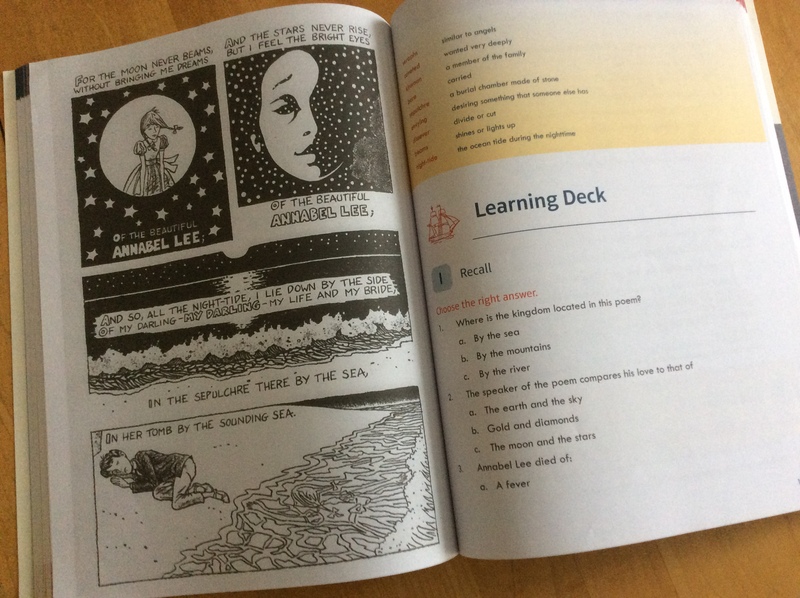 The textbook includes my 6-page comics adaptation of Edgar Allan Poe’s “Annabel Lee,” paired with a number of questions and assignments designed to verify and deepen the students’ understanding of the poem. Several of the questions refer back to my illustrations (ex. What can you see in the waves in the last panel of the comic? Why do you think the illustrator put that there? What are some of the lines that show the bond between the speaker of the poem and Annabel Lee? What are some ways the illustrator shows this same bond?). At the end students are also asked to create their own three-panel comic strip imagining the speaker in the poem speaking to Annabel Lee on her deathbed. This feature in “Lighthouse” seems to me a great example of how comics poetry could be effectively integrated into language learning and literature classes everywhere. This entry was posted in Annabel Lee, comic book poetry. Bookmark the permalink. 10 Responses to My “Annabel Lee” comic a teaching tool in India! L’Inde rend justice à votre talent ! Vos adaptations en BD de tous ces merveilleux poémes , en plus d’être des oeuvres d’art, sont de réels atouts pour une approche pedagogique et attractive. La poésie, les profs, les éleves vous remercient Julian 🙂 Vous nous aidez à toucher l’invisible. Actually, I even had a look to get a copy of this textbook ( as I teach English as a foreign language to teenagers) but sadly, was unable to find it on amazon. any idea of how I could order a copy ? But you coud always try just writing to them directly. That is a good sign! Hopefully they will soon replenish their stock! What a beautiful testimony of recognition! A richly deserved accolade! I must admit, I’ve always been quite partial to your illustrations for this poem. Thanks Louis! Artistic self-doubt is still always breathing down my neck, unfortunately.